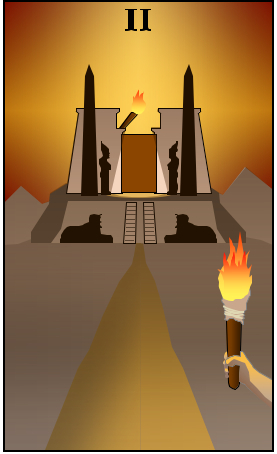 This is the Temple of Ra as seen in a vision. It is also the Two of Wands. At the Two of Wands, we can see the path ahead. We are not yet where we want to be, but the destination is illuminated. The glow is warm and subtle. We are drawn to the light up ahead, but there are many steps yet to take. Come along for the journey; we’re almost there. Stay tuned for more Summer of 2013 Astrology…and more on the Temple of Ra.